For so many years, 10 actually, I was in awful pain daily from chronic low back pain I had as well as from the myalgias and joint pain of lyme disease. In 2012 I was at a very low point due to my pain and I prayed to God to help me find a way. I was also suffering from daily nausea that was two years and counting. This combination of debilitating symptoms was simply too much for me. In Fall of 2012 I came upon a few plant medicines that really helped me. One of them, Amanita Muscaria or Fly Agaric, the famous mushroom depicted in Disney films and iconically known worldwide for its bright red cap and white dots, came into my consciousness and has since been one of my very favorite allies. It is an ally and not an inert plant. When I first started noticing it, I just had a feeling about it, I felt drawn to it. Then I found a woman who had lyme in the UK and had utilized this very plant ally as a remedy for some of her most daunting lyme disease symptoms, and especially pain. I flew through her entire blog with utter fascination and I knew I had to utilize this plant. I started to research more about the beautiful mushroom and what I found was no short of a trip down a rabbit hole, and a visit to wonderland. Not in the way you may be thinking. I found that in Russia, it is utilized for it’s pain killing properties, and has been for eons. It has untold medicinal properties. In Siberian villages, it was used to help the elderly during the winter time for strength and endurance. The Vikings utilized it to become insensitive to pain and feel enormously strong against their conquests. 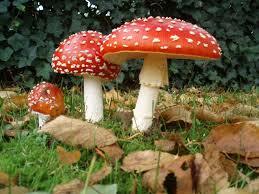 The Shamans of Siberia utilized the mushroom in a sacramental way. In fact, some scholars have argued that it is the ancient Soma of the Rig Veda, and that most religions were channeled out of a sacred intoxication with this plant. While that idea tantalizes the mind, it is certainly too lofty to explore here. What I want to speak of is my experience with this plant, and how it helped me to become free of the plague of chronic pain, structural pain in my back due to disc bulging, as well as the myriad types of pain that lyme disease creates, muscular aches, shooting pains, migrating pain, joint pain. I have been freed of most all of these pains that I had before working with this medicine. I obtained some mushroom specimens as well as a bit of tincture made from them. I began by eating very small amounts to see how I felt. A piece about the size of my thumbnail is what I took to begin, and I felt a slight change, and a few alterations in perception. I started to sweat a lot and felt extremely happy, and I also felt a distinct opening of my heart. It didn’t occur right from the start, but I continued experimenting with it in different forms. I made an oil from it, I heated it in butter, I soaked it in grape juice, I used the oil transdermally, and then I got my tincture. This, I put directly on my spine, where my back pain was. Key word is WAS. Over the next few weeks I started to notice I didn’t have any pain. If I would stop utilizing the mushroom, the pain would return. But one of the things that was so surprising to me, is after the initial few weeks of experimentation, I simply had to use 1 drop right on my spine and it took all my pain away for about a week. Even in areas where I did not put the drop. No back pain, no muscle aches, it was all just kind of gone. I still had some breakthrough pain in my neck and shoulders, but the majority of my pain was reduced to almost nothing. I came off of my pain medication I had taken for the past 7 years thanks to this friend in the plant kingdom, and I am still off of them completely as I still (Nov 2013, a year later) have no pain. The pain reduction isn’t the only benefit I received from this plant. I had much more energy when I used it and I found my depression started to dissipate. I felt a definite sense of the Spirit realm and a connection to nature, yet I didn’t trip out or anything like that, but I did feel like the plant was communicating with me in various ways. I started to see it everywhere, and I also started to find a lot of amazing information on it, including others who had used it with success to heal everything from arthritic joints to severe lifelong depression. All of a sudden my friends started to see it everywhere, it was a very cool phenomenon. I continue to use this very sacred plant ally through tincture I make myself. I use it daily to take away the pain of living with lyme disease, as there has been a tolerance I have developed and I do need more now. I currently use about 5-8 drops on my spine per day. The pain reduction qualities are so impressive with this plant, I started to wonder why we know nothing of it, why science isn’t figuring out how to make the best pain medicine that is totally non-addictive from it. I, mean, I had tried all of the medical industries “solutions” to pain, and YUK. It is a world fraught with despair and addiction, and often the pain becomes just as bad after you get used to their narcotics and you are still in pain, yet now you are an addict too. It is a dark world, and there is great need for the relief this plant brings. When I started working with Amanita, It felt like I was developing a relationship with the energy and essence of it. There is no prescription for it. You must work with it and see how it responds to you individually, as well as use caution because it is an entheogen, and can be poisonous. So I started very cautiously and I do feel there was some adjustment my system had to make to it, like I had headaches at first after using it. But I no longer get them. I think that there is a detoxification process that it puts you through before revealing it’s gifts of pain annihilation, increased energy and stamina, and a happy disposition. I feel that there is a healing quality to it on top of it’s analgesic properties. Entheogens and sacramental plants are making their way back into the consciousness of the masses, and it is my belief that they hold many of the answers to our most pressing questions of health and healing, and can help us to become like the phoenix that rises from the ashes.